Definition at line 2139 of file lscript_tree.h. Definition at line 2142 of file lscript_tree.h. Definition at line 2152 of file lscript_tree.h. Definition at line 9188 of file lscript_tree.cpp. Definition at line 9220 of file lscript_tree.cpp. Definition at line 9197 of file lscript_tree.cpp. 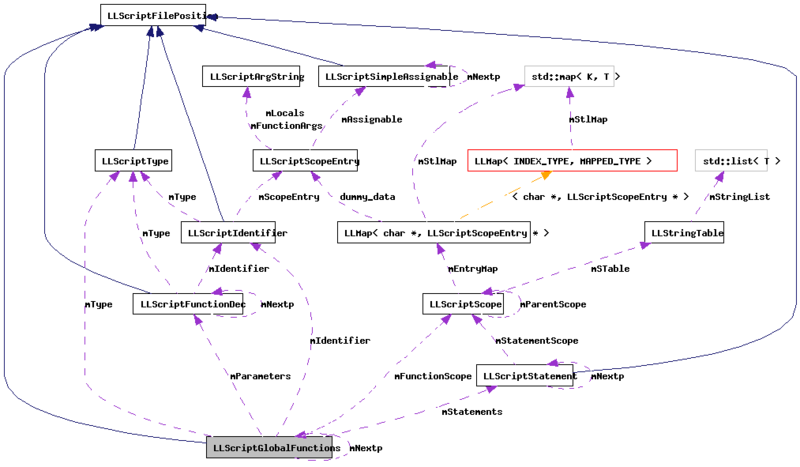 Definition at line 9225 of file lscript_tree.cpp. References add_return(), LLScriptByteCodeChunk::addBytes(), LLScriptScope::addEntry(), LLScriptScope::addParentScope(), LLScriptScope::checkEntry(), LLScriptByteCodeChunk::connectJumps(), FALSE, LLScriptFilePosition::fdotabs(), gErrorToText, LLScriptGenerateErrorText::getErrors(), gonext(), gScopeStringTable, integer2bytestream(), LIT_FUNCTION, LSCP_BUILD_FUNCTION_ARGS, LSCP_EMIT_ASSEMBLY, LSCP_EMIT_BYTE_CODE, LSCP_EMIT_CIL_ASSEMBLY, LSCP_PRETTY_PRINT, LSCP_PRUNE, LSCP_RESOURCE, LSCP_SCOPE_PASS1, LSCP_SCOPE_PASS2, LSCP_TYPE, LSCRIPTDataSize, LSCRIPTTypeByte, LSERROR_DUPLICATE_NAME, LSERROR_NO_RETURN, LSPRUNE_GLOBAL_NON_VOIDS, LSPRUNE_GLOBAL_VOIDS, LST_INTEGER, LST_NULL, mbNeedTrailingReturn, LLScriptByteCodeChunk::mCodeChunk, LLScriptScopeEntry::mCount, LLScriptByteCodeChunk::mCurrentOffset, LLScriptScopeEntry::mFunctionArgs, mFunctionScope, mIdentifier, LLScriptScopeEntry::mLocals, LLScriptIdentifier::mName, LLScriptScopeEntry::mOffset, mParameters, LLScriptIdentifier::mScopeEntry, LLScriptScopeEntry::mSize, mStatements, LLScriptArgString::mString, LLScriptType::mType, mType, NULL, params, print_cil_local_init(), print_cil_type(), print_return(), LLScriptStatement::recurse(), LLScriptFunctionDec::recurse(), LLScriptIdentifier::recurse(), LLScriptType::recurse(), S32, TRUE, and LLScriptGenerateErrorText::writeError(). Definition at line 2168 of file lscript_tree.h. Definition at line 2167 of file lscript_tree.h. Referenced by recurse(), and ~LLScriptGlobalFunctions(). Definition at line 2163 of file lscript_tree.h. Definition at line 2166 of file lscript_tree.h. Referenced by addGlobalFunction(), gonext(), and LLScriptScript::LLScriptScript(). Definition at line 2164 of file lscript_tree.h. Definition at line 2165 of file lscript_tree.h. Definition at line 2162 of file lscript_tree.h.